Nog was a Ferengi male born as the only son of Rom and Prinadora. Rom had married Prinadora under a standard Ferengi five-year marriage contract, but was so blinded by love that he let Prinadora's father swindle him out of all of his money. Prinadora left Rom, and Rom was forced to raise Nog alone. As a young Ferengi, Nog was required to memorize the Rules of Acquisition and study the philosophy of the Great Material Continuum. In time, he was expected to become a merchant and to acquire wealth like a good traditional Ferengi male. At some point during the latter years of the Cardassian Occupation of Bajor, Rom and Nog took up residence on Terok Nor and began work as waiters in Quark's bar. In 2369, Nog was still living on Terok Nor when the Cardassians withdrew. The Bajoran Provisional Government asked Starfleet to take over administration of the station, and it was rechristened Deep Space 9. On the day that new station commander Benjamin Sisko arrived, Nog was helping a thief to steal supplies from the Promenade. He was apprehended by Odo, the station's chief of security, and put into custody in the station's holding cells. Sisko used Nog's release as a bargaining chip in order to persuade Quark to stay on the station and keep his bar open and to become community leader, Sisko's way of giving the disparate community there a focus and a reason to stay. On the station, Nog quickly met Jake Sisko, Commander Sisko's son, as there were only a few children on DS9. As a result, Jake and Nog spent a lot of time together and soon became close friends. They had many adventures and misadventures together and often engaged in mischief and occasionally got in trouble for playing pranks on the station. Much of their time was spent on the Promenade, where they watched the passengers disembark. Benjamin Sisko initially did not approve of Jake's friendship with Nog. He believed him to be too old and too corrupting for Jake. However, his disapproval quickly faded when he discovered that Jake and Nog were not planning another prank as he had suspected, but that Jake was teaching his friend how to read, indicating a deep and constructive friendship. Realizing that Nog was not a bad influence on Jake, Sisko finally began respecting his son's friendship with the Ferengi boy. Nog eventually attended Keiko O'Brien's primary school on the station, despite his father's initial reservations at his son being taught by a Human female. When the Bajoran factions Paqu and Navot were negotiating an agreement on DS9, Nog saw Varis, the Paqu negotiator, who was an attractive young girl, and became instantly infatuated with her. Because he was reluctant to meet her, he asked Jake if he could arrange it. Upon meeting Nog with Jake, Varis shared her frustrations about the ongoing negotiations and Nog offered her a suggestion how the dispute could be solved to the satisfaction of both parties. Although Nog did not become romantically involved with her, he did get a kiss on his cheek when Varis left DS9 after successfully finishing the negotiations. In 2370, Nog was evacuated for a short time from DS9 because of the threat of Bajoran incursion. He also was attacked by Tumak when he sprayed some foul-smelling fluid on him. When Nog was asked to go on a camping trip in the Gamma Quadrant with Jake and Commander Sisko, he could not say no to the invitation but was less than pleased when his uncle Quark insisted on coming with him. After they landed on a planet, Jake and Nog went into the woods and when they returned to the campsite, they discovered that Sisko and Quark were gone. Soon they discovered that the two had been captured by a previously unknown force from the Gamma Quadrant – the Dominion – and decided to take the runabout and return to DS9, but encountered problems when they realized the controls of the runabout were secured. Nog told Jake that he could circumvent the security protocols but he only partially succeeded and was able to restore altitude control but not warp capability. While being chased by Jem'Hadar, they were located by Miles O'Brien, piloting another runabout. The two were present to witness the destruction of the USS Odyssey before they safely returned to DS9. 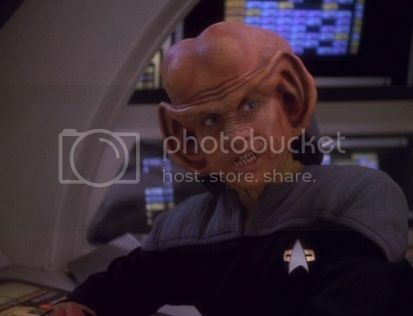 After they returned, Nog decided that he wanted to be the first Ferengi to serve in Starfleet, but at the time of his application, Ferenginar was not a member of the Federation. Because of this, his application needed to be endorsed by a command-level Starfleet officer, where upon Nog asked Commander Sisko if he would support his application to Starfleet Academy. Sisko was suspicious of Nog's motives and initially refused the request. After some persuasion, he decided to test Nog to see if he was serious about the endeavor. He assigned Nog a cargo bay inventory, by himself, to test his dedication as well as his honesty. To his surprise, Nog not only persisted, he also surpassed his expectations. Sisko confronted the boy about why a Ferengi would want to join Starfleet, a profession with no potential for profit. Nog finally admitted that he wanted to make something of his life so that he wouldn't end up like his father. Nog had seen how his father could have been chief engineer on a starship, but instead had pursued only profit like "a good Ferengi," and as a result, ended up with nothing to look forward to but the slim chance he would someday inherit Quark's Bar, and Nog didn't want to follow in his footsteps. On hearing this, Sisko finally understood and was glad to give Nog his full endorsement. In 2372, Nog's uncle Quark received a shuttle from his cousin Gaila (which was sabotaged) and he decided to bring Nog, accompanied by his father, to Earth so he could enter Starfleet Academy. When they were close to Earth, the sabotage was revealed, which caused them to crash land and they found themselves on a military base in Roswell, New Mexico in the year 1947. There they were observed and thought to be Martians, and after they repaired their universal translator, Quark tried to make a profit from the situation. When things started to go badly, Nog tried to bluff their way out of the situation by telling their military interrogators that they were the first of an invasion force. Fortunately for them, they were helped with their escape and were able to return to their own time period. During his time in the Academy, Nog was a frequent visitor of Sisko's, a Creole restaurant owned by Joseph Sisko in New Orleans. It was the only eatery on the planet where he could get tube grubs. During the Changeling scare on Earth, when some Starfleet officers felt that a coup was necessary to protect Earth, Nog supplied information to Sisko that helped foil the coup. Sisko suspected that officers in Starfleet had caused a world-wide power failure in order to declare martial law. Nog told Sisko about the Red Squad, an elite group of cadets, and gave him the names of the members. They were the ones who caused the power failure on the orders of Admiral Leyton. In 2373, Cadet Nog was stationed on DS9 during his sophomore year as part of a field studies program. While there, he used his superior hearing to help Lieutenant Commander Dax and Major Kira unscramble a recorded message in the hope of solving the mystery of who was killing the surviving members of the Shakaar resistance cell. Jake also moved in with Nog at this time. In that same year, Nog took part in a mission to retrieve components from Empok Nor, an abandoned Cardassian space station, to repair DS9. During this mission, two stasis chambers containing Cardassians were activated. When the two Cardassians destroyed the runabout that had brought Nog and O'Brien to Empok Nor and killed Crewman Boq'ta and others, he and the chief were the only ones left to deal with Elim Garak, who had been infected by the same psychotropic drug which had driven the other Cardassians insane. After Chief O'Brien successfully saved Nog and Garak, Nog vowed he would never turn his back on the Cardassians again. He later used his Ferengi skills to wheel and deal to help Jake obtain an old baseball card for Jake's father. Nog fought in the Second Battle of Deep Space 9 when the Dominion and Cardassian forces captured the station. In 2374, after the outbreak of the war between the Federation and the Dominion, Nog took part in the raid to destroy the major production facility of ketracel-white inside Dominion territory. Although the mission was a success, the captured Dominion ship was severely damaged and had to make an emergency landing on a remote planet, leaving them seventeen years from the nearest starbase. While Nog and Garak were searching for food, they were captured by Jem'Hadar soldiers and brought to their wounded Vorta leader. Garak told them that they had a doctor with them and they were exchanged as hostages for Captain Sisko and Doctor Bashir. In the end, they had to fight the Jem'Hadar because the ketracel-white they depended on had run out and their Vorta leader could no longer control them. During their last attack, all the Jem'Hadar were killed. A short time before Operation Return was to be carried out he was promoted to ensign. This is after just two years as a cadet, as opposed to the normal four. He took part in the battle to retake Deep Space 9. When the USS Defiant was captured by the Jem'Hadar, he helped retake the ship. He pretended he was fixing the warp drive that had been damaged in the attack. But this was a delaying action until they could be rescued. On stardate 51825.4, Ensign Nog was en route to Ferenginar with Jake when they were attacked by Jem'Hadar. Suddenly they were beamed aboard the USS Valiant, a Defiant-class starship. Nog recognized the crew operating the Valiant as Red Squad, an elite group of cadets from Starfleet Academy. Their twenty-year-old captain, Tim Watters, told him that the rest of the crew had been killed and that he intended to complete the Valiant's mission, gathering data on a new Dominion battleship. Nog, a long time admirer of Red Squad ever since his Academy days, was enthusiastic and joined the crew. He was given a field promotion to lieutenant commander and made chief engineer, where he adjusted the Valiant's warp capabilities as he had seen O'Brien do on the Defiant. When Watters wanted to attack the battleship, Jake told Nog that it was a suicide mission. Watters overheard this conversation and had Jake confined to the brig. During the battle, the Valiant sustained heavy damage and only Nog and Dorian Collins were left alive. They released Jake from the brig and used an escape pod to leave the Valiant before it exploded. They were later picked up by the Defiant. Nog then returned the Red Squad insignia he had received from Watters to Collins. During the siege of AR-558, Nog performed well as an advance scout, using his superb Ferengi hearing to identify a large column of advancing Jem'Hadar when tricorder scans were ineffective due to a Jem'Hadar jamming signal. It was during this action that he lost his leg after fierce fighting with Jem'Hadar soldiers, who outnumbered the Starfleet forces three-to-one. When Nog was recuperating in a makeshift infirmary, a Jem'Hadar burst in but Quark managed to kill him, saving his nephew from certain death. In part because of Nog's actions, and those of his fellow troops, the Federation was able to hold the planet and the vital Dominion communication array there. When he returned to DS9, Nog was still recovering from his injuries and, although his leg was replaced by a biosynthetic one, he was still struggling to cope emotionally and physically with his wound. Because he did not want to be helped by anyone he took his medical leave in one of his uncle's holosuites, hiding in the 1962 Las Vegas club of singer Vic Fontaine. During this time, Vic affectionately nicknamed Nog "Noggles". Later, when Nog found Jake and his date Kesha in Vic's lounge, he was upset and in an angry outburst, he punched Jake, whereupon Vic threw Nog out of his club. Ezri Dax visited Nog to persuade him to leave the holosuite, but he refused. He even threatened to resign his Starfleet commission if she tried to make him leave. While Ezri observed him, she noticed that he had made progress. He no longer seemed to limp or need to use his cane. Congratulating Vic with his accomplishments with regards to Nog, Ezri let him know it was time for Nog to leave the holosuite. When Vic told Nog he had to leave he protested, but to no avail, considering that Vic resorted to ending the program on his own and resisted it being reactivated. I n the end, Vic convinced Nog that it was better for him to leave and rejoin the real world. Nog thanked him, and to show his gratitude, made arrangements with his uncle Quark to keep the holoprogram running permanently. Nog took part in the Second Battle of Chin'toka as a member of the Defiant crew, and when the Dominion War ended in 2375, Nog was promoted to lieutenant junior grade in one of Benjamin Sisko's last official acts as the commanding officer of DS9. Just before Lieutenant Commander Worf departed Deep Space 9 to begin serving as Federation Ambassador to the Klingon Empire, as a going away present Nog gave him a Ferengi phaser which he swore was immune to most forms of tampering. He was right and Worf was able to use the phaser even under a dampening field and was able to stop a group of Klingon rebels from taking over the Federation Embassy on Qo'noS. In April 2376, Nog was part of a maintenance team on-board the Defiant when the ship was forced to do battle with three rogue Jem'Hadar fighters which had launched an attack on DS9. In the battle Nog and the acting commander Ezri Dax fired the Defiant's warhead module to finish off the last Jem'Hadar. Following the battle Nog was nominated for a Starfleet commendation for his conduct. Also arriving at the station at this time was the Jem'Hadar observer Taran'atar, sent by Odo to observe the people and culture of the Alpha Quadrant. Due to his experience at AR-558, Nog was unable to accept Taran'atar as anything but a Jem'Hadar killer. When DS9 needed a new fusion core, Nog was the one who came up with the solution. Working with the SCE crew from the USS da Vinci, Nog managed to have the derelict Cardassian station Empok Nor towed from the Trivas system to the Bajoran system, to serve as spare parts (including a fusion core) for DS9. In May, Nog and station Science officer Thirishar ch'Thane discovered a way to briefly disrupt a network of Iconian Gateways during the "Gateways Crisis". In August, Nog participated in an exploratory mission of system GQ-12475 in the Gamma Quadrant onboard Defiant's shuttlecraft Sagan. Nog, along with Dax and Bashir, encountered an extremely alien artifact called both cathedral and anathema by local races, the D'Naali and Nyazen. Contact with the object briefly connected Nog with an alternate reality version of himself that had never lost a leg. The result was a physiological 're-set' of Nog's physical being, causing his leg to regenerate. However, keeping the leg meant becoming that alternate Nog who had never joined Starfleet. Nog decided to return to the cathedral/anathema to have the 're-set' reversed. After coming to terms with his injury and realizing that Taran'atar was not the Jem'Hadar that shot his leg off, Nog was restored to his original physical state. In November, Nog spent a week on Ferenginar to attend the birth of his half-sister Bena, daughter of Grand Nagus Rom and his Bajoran wife Leeta. While he was on Ferenginar he visited his mother for the first time since he was a small child, and helped his father stave off an attempt by Congressman Brunt to have Rom removed as Grand Nagus.